1/11/18 – Gorgeous Goosie has gone to her new home! This adorable lady is Goosie the 10 year old sweetie Staffy. She’s in the care of RSPCA South Godstone Animal Centre in Surrey. Her previous owner could no longer care for her due to their poor health. Now Goosie is searching for a quiet home where she’ll have company most of the time, someone to potter about with and share snuggles. When Goosie first arrived at the centre she was very overweight. She’s looking for a new owner who will continue her weight loss until she’s the perfect weight. She’s already doing amazingly well! One of Gooise’s favourite things is running around in the off lead enclosures, chasing after tennis balls. She enjoys her walks out in the long grass and woodlands. Whilst in rescue Goosie has met a few other dogs and has got on well with them. It’s thought that she could live with another calm dog as long as they meet at the centre first. Goosie has previously lived in a home with cats. So she could possibly live with cats that are used to dogs being around, after careful introductions. 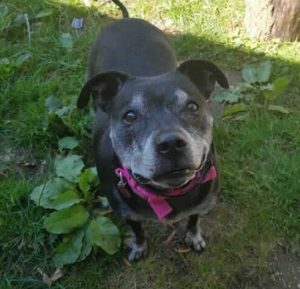 As an older lady Goosie is looking for a quieter household, therefore we feel that children of secondary school age would be best suited to her. She’s a typically loving Staffy girl who really does like a fuss! Goosie is spayed and healthy (apart from being a bit too round). She is toilet trained and has to be taken her out for toilet breaks as she will not go in her kennel. She’s a very good girl with a big open heart! Please mention that you saw Goosie on the Oldies Club website.